You don’t need an economist to put a dollar figure on the value of partnership between NorthBay Healthcare and David Grant U.S. Air Force Medical Center. It only takes one of the many patients who are alive today because of that collaboration to tell you it’s priceless. Above: Lt. Col. Shea Pribyl, D.O., poses with patient Evelyn Stanley, whose life was saved after suffering a torn aeorta. Take Evelyn Stanley, for example. In December 2017, the Fairfield resident collapsed with a torn aorta, a life-threatening condition. The ambulance delivered Evelyn and her husband to David Grant, on Travis Air Force Base. Cardiothoracic surgeons Shea Pribyl, D.O., and Curtis Wozniak, M.D., were called. But that morning the ancillary support staff needed wasn’t available at the base hospital, so they raced her to NorthBay Medical Center in Fairfield, where both military physicians have working arrangements to be on call and perform surgeries. NorthBay Medical Center is Solano County’s only Chest Pain Center, and stands ready with both a catheterization lab and a special heart and vascular surgery suite to handle such surgeries at a moment’s notice. “They were nothing but amazing,” recalled Dr. Pribyl. “They got our call and said, ‘bring it on!’” Also joining in on the collaboration was cardiothoracic surgeon Gasevoort Dunnington, M.D., from St. Helena, and NorthBay Healthcare cardiac anesthesiologist Adam Tibble, M.D., a former Air Force physician. Not only did Evelyn survive the surgery, but she shared her story and took time to thank NorthBay Healthcare staff and her David Grant physicians. During their formative years, there were many informal relationships between the base and NorthBay hospitals—borrowing or sharing equipment, training labor and delivery nurses and referring patients for cardiac and pulmonary rehabilitation, for example—but it has only been in the last decade or so that the relationships have become more formalized. Col. Patrick Shea, M.D., chief of medical staff at David Grant Medical Center, agreed. “Air Force doctors, surgeons, nurses and medical technicians at Travis must be primed and ready to deploy anytime, anywhere to care for Airmen injured during combat operations. David Grant patients don’t always have the complex medical conditions our surgeons need to maintain clinical wartime proficiency. We must work at civilian hospitals that routinely treat critically ill patients and victims of explosions, stabbings and gunshot wounds,” said Dr. Shea. David Grant has agreements to share resources with a number of hospitals and medical centers in Northern California, including NorthBay Healthcare, which provides labor and delivery training to military nurses and final phase medical training for laboratory, pharmacy and radiology students. NorthBay’s inpatient pharmacy trains David Grant pharmacy residents on the challenging aspects of inpatient chemotherapy preparation. It also works closely with three cardiothoracic surgeons and two neurosurgeons, who are on call for emergencies, and also sometimes bring their patients—such as Evelyn—to NorthBay facilities for treatment. Another nine surgeons are assigned to the NorthBay VacaValley Hospital campus. According to Dr. Shea, David Grant providers average about 22 hours per month at NorthBay facilities. “Both hospitals benefit because NorthBay’s support staff is fully engaged and David Grant patients get the treatment they need,” he said. “Participants learn how to research and critically analyze data, and put together a poster—like a science fair—to show their results. By sharing our findings, both hospitals and teams benefit and, ultimately, our patients also benefit,” said Dr. Shea. Joe Carter and his wife Ruby were having the time of their lives on a cruise to the Mexican Riviera last November. There was a family reunion, his niece got engaged, and much fun was had by all. Joe Carter, with heart pillow, and his wife Ruby were thrilled with the excellent care at NorthBay Medical Center and returned to the facility to thank, left to right, ICU nurse Arold Nelson, R.N., Karen Loewe, R.N., clinical manager for NorthBay Cardiac & Pulmonary Rehabilitation and Lisa Ensley, R.N., far right. But two weeks later, he struggled to breathe. Pneumonia set in, and the retired Navy yeoman first class found himself at David Grant Medical Center, the first of four visits in a two-month period. He couldn’t seem to kick it. “Finally, my cardiologist, Dr. David Appel, suggested an MRI so he could take a look at what was going on,” Joe recalled. A leaky valve was suspected and the MRI confirmed that he needed surgery. He met with specialists, underwent a number of tests and considered his options. He decided to come to North-Bay Medical Center where his Air Force cardiothoracic surgeons—Drs. Pribyl and Wozniak—could team up with cardiothoracic surgeon Gasevoort Dunnington, M.D., of St. Helena and NorthBay medical staff for surgery close to home. “The entire team was outstanding,” said Joe from his Suisun City home. He was particularly thankful for the compassion of Arold Nelson, R.N., who talked him through recovery in the Intensive Care Unit and the oversight of nephrologist Steven Tolkan, M.D. 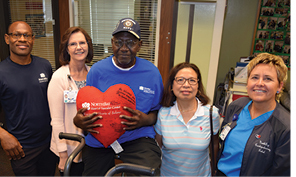 And, he has been able to receive ongoing care through NorthBay Cardiac & Pulmonary Rehabilitation.